Can you post Senter’s Order from August 10? Order 344. I’d like to see the “criteria”. For which no “stick built” or Exactimate estimation of the flood damage was made before the SFIP limits were paid. I find that setting such a time-frame is required in the interest of justice. Accordingly, it is hereby ORDERED That State Farm Fire and Casualty Company shall submit the list called for under item number 6 in my order  of August 10, 2009, within thirty days of the date of this Supplemental Order, i.e. on or before the close of business on October 19, 2009. SLABBED provided the post-hearing briefs – Read ‘em while they’re hot – briefs filed by State Farm, Haag, Forensic, and Rigsbys post-hearing in the Rigsby qui tam – and linked the documents filed by the defendants following Judge Senter’s Order – Evideniary disclosure is Michael Oher of Rigsby qui tam. Claiming the Forensic motion for clarification is an impermissible attempt to relitigate issues that were correctly decided in the first place, today the Rigsbys filed Relators’ Opposition to Motion of Forensic Analysis & Engineering Corporation for Clarification of Order Denying Motion for Summary Judgment. Forensic, like Haag, attempts to hang its hat on the date the McIntosh claim was paid – grasping at a straw man, no doubt encouraged by State Farm. Behind door #1 – Xactware come on down! A number of complaints have been filed with the Justice Department regarding what appears to be an effort to fix prices in the property insurance claims repair business. It involves a company called Xactware, which is a wholly-owned subsidiary of the Insurance Services Organization. The writer, an independent business owner, was concerned because the practices in question impact my business, my employees and my family – raising the question: What practices? Again, a question is raised: What is Xactware’s data in Xactimate if it isn’t a “pricelist”? There is also no doubt that these so-called price lists can be manipulated BOTH downwards and upwards if the client requesting the “price” has a vested interest in doing so. Author Posted on September 10, 2009 Categories Branch Consultants qui tam case, Claims Dumping, Claims Handling, ex rel Rigsby v State Farm, False Claims Act, Flood Insurance, Hurricane Katrina litigation, Insurance, Insurance Law, XactwareTags ex rel Rigsby v State Farm, Price Fixing, Schafer v State Farm, Xactware3 Comments on Behind door #1 – Xactware come on down! How hot is the hot spot for Rigsby qui tam? I actually was in Biloxi when I wrote…[the Wind-Water Protocol]… And I had done — Iwent out and saw the damage, basically, and saw the — well, the first area I went to when I was there was right near this claim office on Pops Ferry Road in Biloxi (Location A). There’s this development called Destiny Plantation. 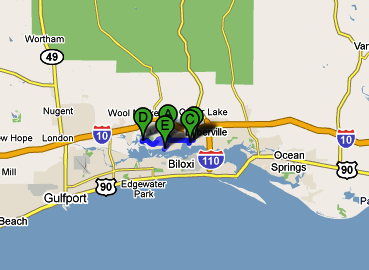 (Location C) It’s right on the back bay of Biloxi. And I had occasion to drive down there. And I — there, I comprehended the nature of the damage, is what made me kind of outline in my mind how to do this. But the gate to Destiny Plantation is on Brody Road (Location B), which is about a half a mile inland from the shore. You go in the gate and there was no damage whatsoever to the homes immediately around the gate. You take the road south toward the bay, and immediately you notice where the water stopped. And by the time you get down to the bay itself, the homes that were built were totally destroyed. They were slab homes. Which indicated to me that we’ve got a situation here. 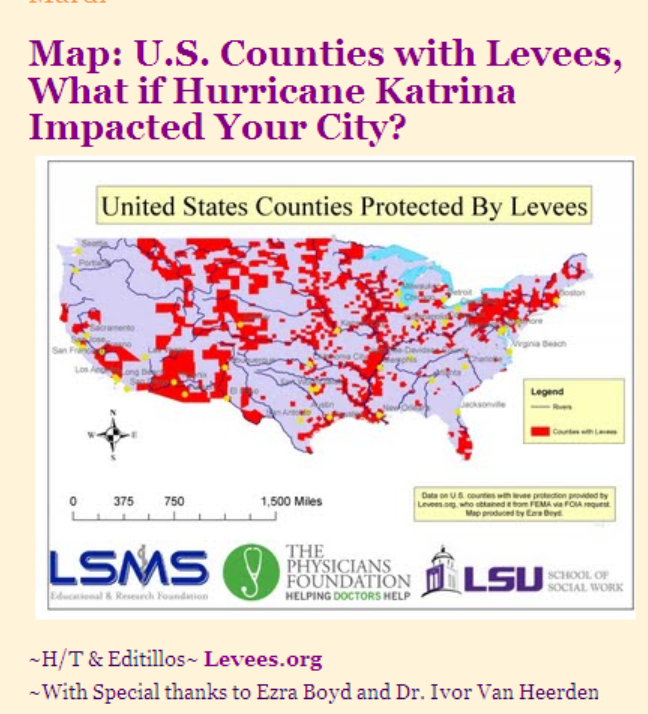 How many other hot spots were there given the estimated number of State Farm policyholders with dual coverage Hinkle provided applied to the flooded areas of all three coastal counties and not just this one area in Biloxi? Author Posted on September 4, 2009 Categories Bossier v State Farm, Claims Handling, ex rel Rigsby v State Farm, Flood Insurance, Hurricane Katrina litigation, NFIP, Rigsby Sisters, State Farm, State Farm Wind-Water ProtocolTags ex rel Rigsby v State Farm, Hickman Goza & Spragins, Hired Guns, McIntosh v State Farm, Pontius v State Farm, Rigsby Qui Tam, Scot Spragins, State Farm Wind-Water Protocol1 Comment on How hot is the hot spot for Rigsby qui tam? Plaintiff does not have carte blanche in the discovery process (and Plaintiff’s thoroughness in the pursuit of information may not equate to discoverability), but at the same time Defendant should not unilaterally determine that certain material is restricted. Judge Senter’s Order granted the Bossier’s motion in part and modified Magistrate Judge Walker’s order in part. However, what he means by, “The issues in this case appear to be no different from those in other typical Hurricane Katrina lawsuits” is very different from what a good many others would mean by those same words – and that part confounds the total impact of the Order. …the Magistrate Judge required State Farm “to produce those documents containing [Defendant’s] directives, guidelines, policies and procedures for handling Hurricane Katrina claims in general or Plaintiff’s claim specifically.” Anything beyond, including the formulation of those directives, guidelines, policies, and procedures, is unreasonable.